Hello everyone! First off: I’m still alive. Yay! Thank you all for the awesome well-wishes. I am recovering as fine as one could expect. I’ve been finding a decent balance between an oxycodone zombie high and being in pain, and with each day I am needing the pain pills less. Yay again! In comic news, for those of you at TCAF (Toronto Comics Art Fest) this weekend, Chris Hastings will be releasing his first full color Dr. McNinja book there, so pick one up! And if you’re in Brooklyn this Friday, Zach Weiner is releasing his first collection of SMBC. Both awesome comics. Welp, there go two main characters. I never really liked them anyways. Perhaps they will find a freshly tenderised NoGG as well – or a curiously well bedecked out faux kitchen with flames, hot and hotter magma on tap with a range of roasting gribbletes options. Pretty much what Osama Bin Laden is feeling right about now. You can eat pretty much anything with enough hot sauce on it. Glad you aren’t dead. Too bad Pierrot and Krep can’t say the same. Think the oxy will help them? Pierrot is of course right, and they’re being roasted just for the sake of appearance. In reality, they’re both quite safe, having landed on soft comfy cushions, and are now enjoying butterscotch puddings. Ahhh! I’m FROM Tempe! Of course when there’s something actually awesome happening there, I’m in school in another state… Grrr. Also…they can’t be dead, because otherwise who else is gonna rescue Nogg? Right? …right? One of the greatest problem with space helmets is that you can’t cover another person’s mouth to shut them up. Hopefully, someone will have solved that by the time we go spacefaring. Here’s my guess: the fire is just at the rim of the pit. The pit is an entrance into a room underground where some REAL mihrgoot business takes place. Or maybe I’m just in denial because I love both Krep & Pierrot. It’s obvious that QC is an Eeb sympathizer and is a deep undercover member of Interplanet Amity. Perhaps Rickshaw Boans in Eeb-created disguise! Glad you are feeling better Chris. Don’t push yourself too hard for our sake. @MYichao, you poor, innocent schlub! OF COURSE they can be dead, to be replaced by Fiyenna and some random mirhgoot. I mean, look at Farscape — they did that all the time. This page is hilarious in many ways. Considering that these Mihrrgoots don’t seem to use a lot of technology, it wouldn’t surprise me if they actually wouldn’t mind giving up their Eebs. Especially if all the other species lost their Eebs too, since they’d be more dependent on them, thereby tipping the scales of power in the Mihrrgoots’ favour. @Kathleen, I happen to be reading “Game of Thrones” right now myself. Oye. It is a bit of a bloodbath, isn’t it. I’m with the camp that thinks the pit of fire is a clever ruse, and the king is going to be their ace in the hole at the G.O.B. for changing the definition of sentient. @Gillsing: But then how would they be spacefaring without them? Just poked my nose in to say I LOVE the comic. I can’t remember how i found it – SMBC, maybe? – but it gets better with every page. haha I just had this great image: them standing up in the waist deep pit, saying, “oh yeah, these suits are fire-retardent” but then of course the mirghoots see them sticking up and eat them. @chris: It’s just so darn realistic! living in medieval times sucked. @Kathleen: Yeah, I was wondering how heat resistant their suits are. Also: Are there any native animals left? It appears that the mihrrgoots evolved to eat things at the bottom of pits (like antlions, sort of), but I’ve only seen a space tree. Perhaps with technology the population exploded and native animals slowly went extinct from overeating. Or maybe the mihrrgoots magically appeared out of nowhere. The above comment brought to you by musings on tastiness of eebs. I am also thinking about ways that they wouldn’t be dead, because Krep and Pierrot are my favorite characters! Pierrot and Krep are clearly about to be made bionic like Yuri. @Frank: I’m not so sure the Mihrrgoots care that much about space faring. But what do I know? I don’t really remember every fact we’ve learned about them. I just figure that a species that seem content to live virtually naked in mudholes might not care too much about flying around in space. 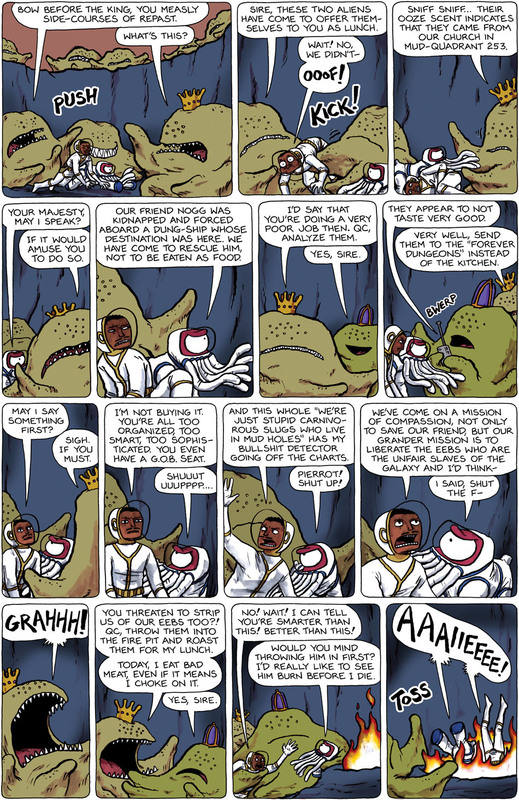 Well, while I hope Christopher is recovering well, I do have one minor remark: If Pierrot an Krep are inside airtight — one hopes, otherwise they’d have different problems — space suits, then why would they care, in the previous strip, how much (or how vile) excrement was poured over them? They wouldn’t notice. One good space suit decontamination procedure, and done! Question. Is the “mud quadrant 253” a sly reference to the area code out here in Tacoma?